Born in 1955 in Chongqing, China, Zhou Chunya became a contemporary painter and sculptor. He is best known for his related works in two and three dimensions. A strong influence of traditional Chinese painting and German Neo-Expressionism is easily recognized in his artworks. The latter can be traced back to his graduate school days in Germany, where he obtained his Master’s degree from the Kassel Academy of Fine Art in 1988. Zhou returned to China in 1989. His education is not the only German thing to inspire Zhou. It is his dog, a German Shepherd named Heigen, that takes the most credit for these exquisite pieces of Chinese art. 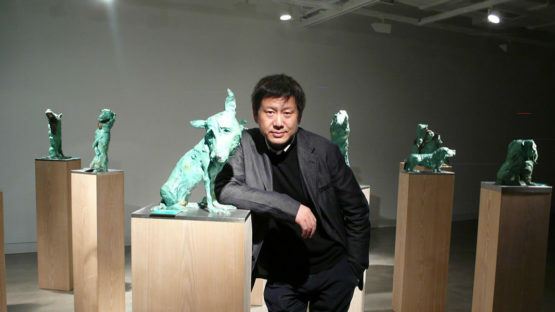 The artist is renowned for his Green Dogs series of artworks. His beloved dog Heigen was the main motif of his art for more than a decade. The bright colors of his choice are no accident since Zhou has a precise shade of green called Italian Classico Verde 290. For the artist, this green dog serves as a symbolic self-portrait. And the color gets its meaning only when people think of it, it is at that moment that it becomes a symbol, says Zhou. And when confronted with Zhou’s paintings, the spectator is bound to look at a mysterious web of symbols. His art depicts the distance between people, with a background of uncertainty and loneliness. 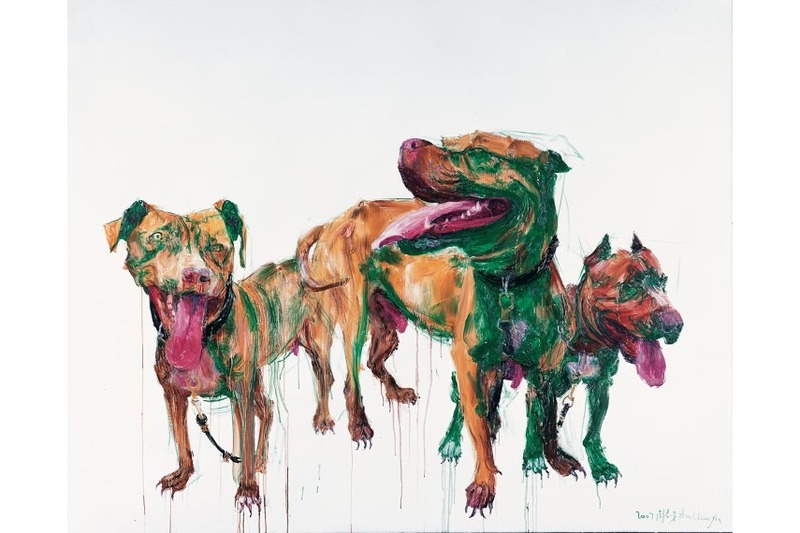 Green Dogs series is a mere projection of the artist’s life circumstances. After his dog had died, Zhou’s style of art changed, as he suddenly sees the beauty of life around him. His motif now becomes peach blossoms, as he watched them blossom, and was moved by their vigor. 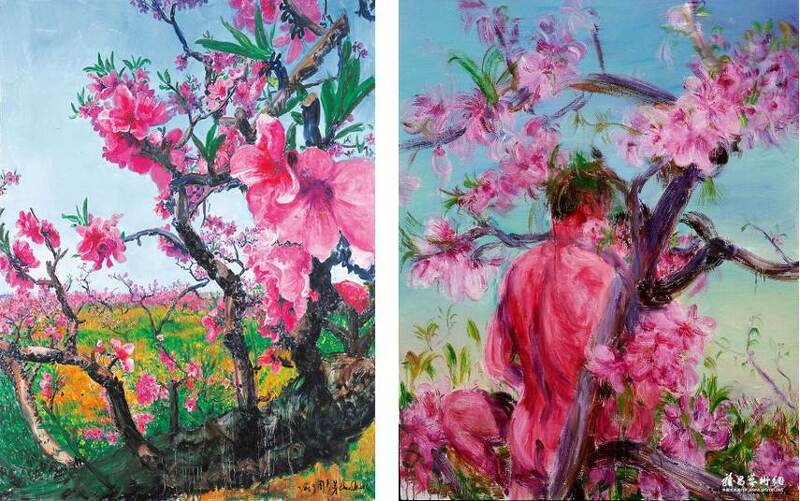 He started combining the traditional Chinese motif with a rather modern approach to sexuality, as his paintings receive pink men and women in an embrace. The figures are sinuously shaped, giving a different meaning to the traditional denotation of the peach blossom tree, which now receives a lascivious meaning. The fragile flowers remind the spectators of the ephemeral nature of life, maybe warning them to embrace the beauty just like lovers embrace one another. Not only is Zhou a prolific artist, counting a number of artistic accomplishments, he also serves as a council member of the Chinese Oil Painting Society and holds several VP positions of different Associations and Committees. 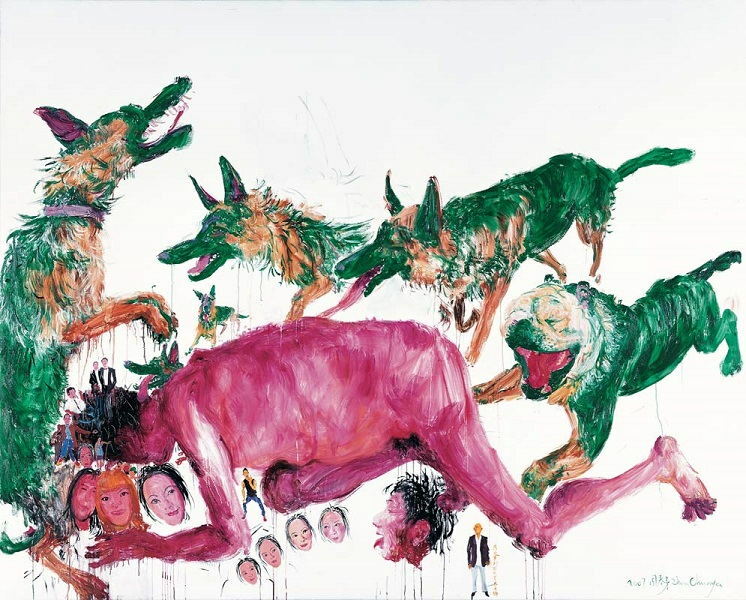 His work has been exhibited around the world, in a number of international galleries and museums – National Art Museum in Beijing, Shanghai Gallery of Art and Museum of Fine Arts in Huston, to name a few. Zhou Chunya lives and works in Chengdu, China.